Set up email "out of office" and switch off! Sometimes it's often the simple things we overlook. Congratulations, you have already ticked off the most important item to have before you travel. You can now traverse the globe with confidence that we will be there for you if the unexpected happens. 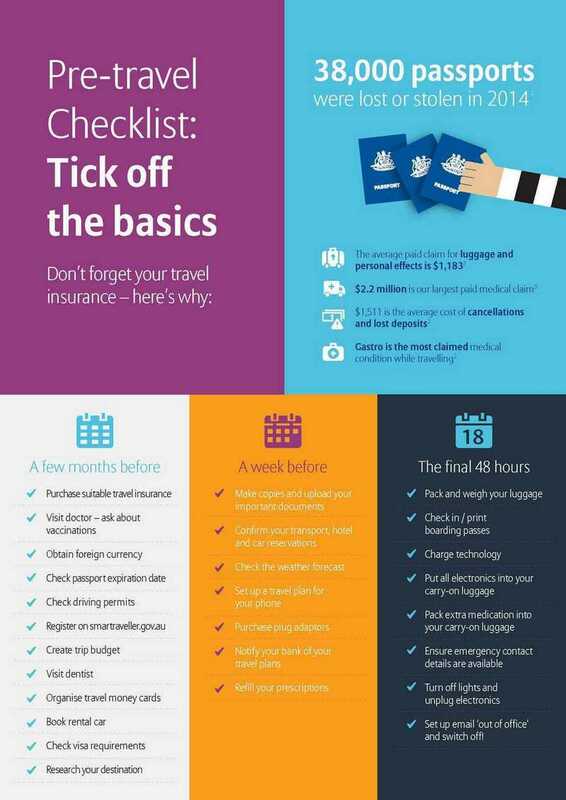 Remember, if you decide to extend your travel then you should also look to extend your travel insurance cover if possible. Check in with your doctor on what vaccinations you might need. 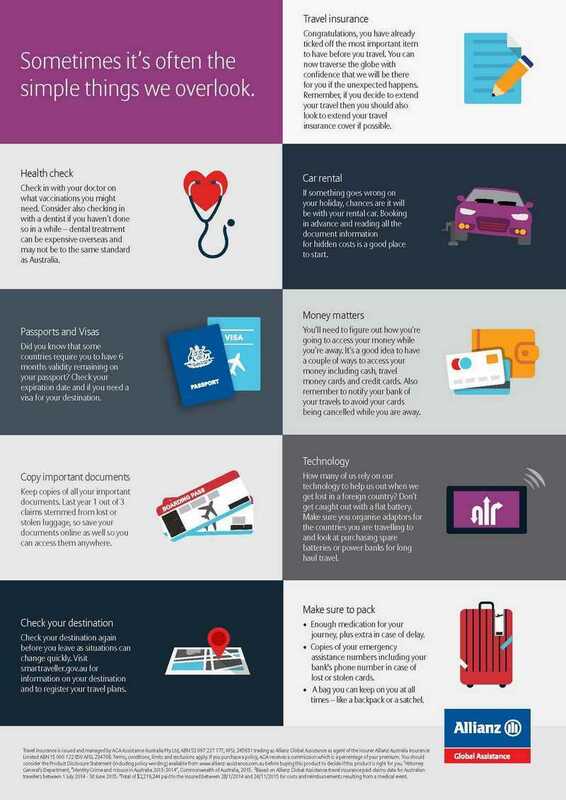 Consider also checking in with a dentist if you haven't done so in a while - dental treatment can be expensive overseas and may not be to the same standard as Australia. If something goes wrong on your holiday, chances are it will be with your rental car. Booking in advance and reading all the document information for hidden costs is a good place to start. Did you know that some countries require you to have 6 months validity remaining on your passport? Check your expiration date and if you need a visa for your destination. You'll need to figure out how you're going to access your money while you're away. It's a good idea to have a couple of ways to access your money including cash, travel money cards and credit cards. Also remember to notify your bank of your travels to avoid your cards being cancelled while you are away. Keep copies of all your important documents. Last year 1 out of 3 claims stemmed from lost or stolen luggage, so save your documents online as well so you can access them anywhere. How many of us rely on our technology to help us out when we get lost in a foreign country? Don't get caught out with a flat battery. Make sure you organise adaptors for the countries you are travelling to and look at purchasing spare batteries or power banks for long haul travel. Check your destination again before you leave as situations can change quickly. Visit smartraveller.gov.au for information on your destination and to register your travel plans.